I am grateful to Ben Myers for the attention he has given to my new book on Incarnation and Resurrection, but concerned that in his long discussion my views are not accurately presented. Let me try to clarify my position. Contrary to what the review states, I do not hold that “we must think first of incarnation and only then of resurrection.” My thesis is, rather, that “incarnation and resurrection are so closely related that if one is compromised in the slightest way then so too is the other” (p. xi). I argue that Christ’s resurrection is the basis of our knowledge of his incarnation, not that his incarnation can be known in abstraction from it. I also argue that Christ’s incarnation is the reason why death could not hold him (Acts 2:24) so that it functions as the basis of his resurrection. I am concerned to avoid all forms of adoptionism and Hegelianism. 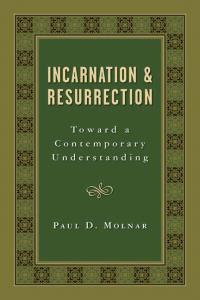 Living in a post-resurrection world, theology cannot proceed as though the incarnation had not taken place. Those who argue that God’s ousia is somehow constituted by the resurrection or that Jesus would not be the eternal Word unless he rose from the dead are in danger of contradicting the Nicene faith of the church. Myers further claims that I adopt a Christology from above instead of a Christology from below. On the contrary, however, I simply claim that we must begin with the man Jesus as attested in Scripture who was and is both truly divine and truly human. As we know in light of his resurrection, he never existed at any time in history as merely divine or merely human, but always as both at the same time. Nor do I hold that the resurrection is “one occurrence alongside others in a linear ‘history of salvation.’” On the contrary, as I state more than once (e.g., pp. 326ff. ), the resurrection is an utterly unique event for which there is no analogy or precedent. Consequently it must be understood from and through itself alone. Resurrection faith begins and ends with Jesus Christ himself (risen bodily from the dead), not with our experiences of hope, nor with our apocalyptic notions, nor with any set of metaphysical ideas (whether actualistically or statically conceived). Perhaps Myers has so much difficulty understanding my book because he holds views that seem very different from mine. Is he reading back into the NT an adoptionist perspective? Does he hold, contrary to the Nicene Creed, that there can have been no logos asarkos? Is it his view that Jesus only became the Word after the resurrection since his divinity was “constituted” by this historical event? This thinking seems contrary to the heart of the NT faith as affirmed by Nicaea and Chalcedon. These ecumenical councils did not impose a classical metaphysics upon theology, but simply clarified the identity of Jesus Christ in light of Scriptural revelation. One of the tell-tale signs of Myers’ idealized view of the resurrection is the fact that he believes that “the category of resurrection functions as metaphysical critique.” Since when was the resurrection a “category”? If, as I believe, the resurrection is indeed an act of God in raising Jesus bodily from the dead, then it could never be construed as a mere “category” that we could wield as the “ground of a proper theological ontology.” That ground has already been laid, and it is, in my view, identical only with the incarnate, risen and ascended Lord himself. Note: Those of you who’ll be at AAR in San Diego might also like to come along on Sunday 18 November to the meeting of the Christian Theological Research Fellowship, where Beth Felker Jones will talk about Molnar’s book, and then Molnar will talk about Jones’ new book, Marks of His Wounds: Gender Politics and Bodily Resurrection. This meeting will take place at 11:45 a.m. in GH-Madeleine A&B (session M18-15 = A18-134).